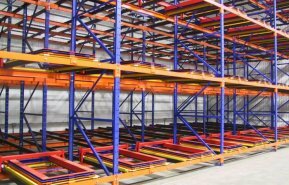 Push Back Rack Systems are defined as being a high-density pallet storage system. This particular system allows for pallets to be stored about six pallets deep on carriers with slightly inclined rails. Pallets are loaded onto the rack via forklift, and as loads are removed, the following load moves down, which allows it to be picked from the rack face in sequence. Pallets are placed on carts with wheels, which allows them to move to the picking position by gravity. When the front pallet is chosen, the following pallet moves forward. Push Back Racks are installed against a wall for a single-sided system or on a center aisle for a double-sided system. When a new pallet is added, the cart will slide back and forth until capacity is reached. Push Back Rack Systems allow for the same amount of storage as Drive-in Systems, without having to operate a forklift into the rack. Forklift drivers never enter the push back rack system, which helps to maintain the quality of the push back rack system and minimize damage. This system provides rapid output and the pallets in each location are selected only by a “Last In, First Out” (LIFO) basis, putting a limitation on stock rotation. The push back rack carts use minimal vertical space in the workspace, as the carts stay together and move forward. Carts can developed for damaged or unstable pallets, as well as color-coded to allow operators to distinguish just how many pallets are in the bay when it is fully loaded. Push Back racks are engineered before they arrive at your work site, and they can be galvanized, if needed, to prevent rust.